My husband was diagnosed with a “frozen shoulder,” and he thinks I have the same problem. What is that, and what can I do about it? Frozen shoulder (also called adhesive capsulitis) is a painful condition caused by inflammation and a buildup of scar tissue. Pain and stiffness gradually worsen for several months until the shoulder loses range of motion (for example, you may have trouble pulling a shirt off over your head) and becomes “frozen.” The classic symptoms are shoulder pain—even at rest—and pain at night that awakens you from sleep. Pain can radiate down the arm but usually not into the hand and fingers. About 2% of Americans suffer from frozen shoulder. The cause of the painful condition is not fully understood, but it can result from immobilization of the shoulder while recovering from a fracture or surgery. Certain health conditions, such as hypothyroidism, diabetes and Parkinson’s disease, also can predispose people to frozen shoulder. All of these conditions have some type of underlying autoimmune component that may increase inflammation in the body. Even if it’s not treated, frozen shoulder does eventually get better for most people. But it can take a long time to heal (sometimes up to three years), and the full range of motion will not come back for some. 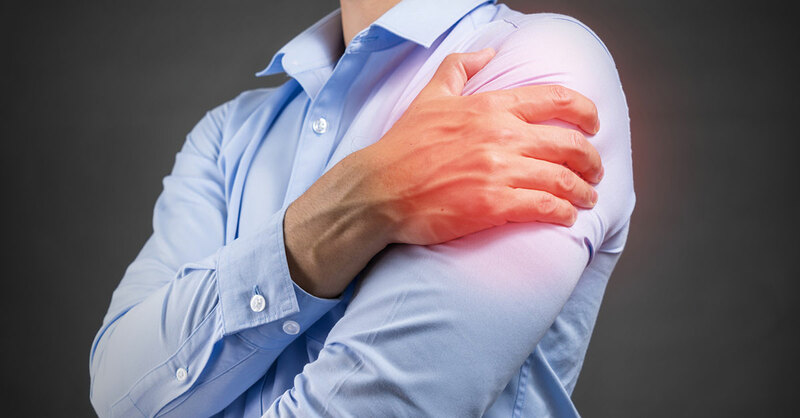 When it comes to the pain associated with frozen shoulder, many patients get effective relief with nonsteroidal anti-inflammatory drugs (NSAIDs), such as naproxen (Aleve) and ibuprofen (Motrin or Advil), or a cortisone injection into the shoulder joint to ease inflammation. A physical therapy program should be followed for several weeks after a cortisone shot to stretch out the shoulder and restore range of motion. The best treatment approach depends on the severity of frozen shoulder—that is, the pain level and deficits in range of motion. In relatively mild cases, this would typically include a two-week course of an NSAID…four to six weeks of physical therapy…and a cortisone injection if needed. For a moderate to severe case, the cortisone injection is used right away because it provides much better pain relief. Stretch #1 (Active Assisted Forward Flexion). What to do: Lie on your back and lift the arm that’s affected by frozen shoulder as high as possible. Use your other hand to gently press the arm upward for 10 seconds. Rest for a few seconds and repeat three times. Stretch #2 (Sleeper Stretch). What to do: Lie on your side with the affected arm outstretched in front of you. Bend the elbow so that the wrist is in the air. Using the other arm, pull the wrist down toward the floor. Hold for 30 seconds. Rest for a few seconds and repeat three times. If these measures don’t help within eight to 12 weeks, talk to your doctor about noninvasive or minimally invasive procedures to break up scar tissue and “unfreeze” your shoulder. Manipulation and/or capsular release surgery both are done while under anesthesia. The procedures may be covered by insurance—but check with your carrier, including whether you need prior authorization before having the procedure. Important: Once the pain is relieved and range of motion improves, you should continue doing the stretches described above every other day to help prevent a recurrence.